At 2 1/2 years of age, I think Tanner is only half way through his childhood. He still loves his toys as much as life itself. At our house, all toys belong to me. By establishing that rule early on, Tanner will always give up a toy if I tell him to Drop It. And thank goodness for that. A few times he has picked up something that may have looked like a toy to him, or perhaps was on the floor, but turned out to be something dangerous or precious. Drop It is a very important command to teach your dog. It could save your marriage if your dog takes off with your husband's favorite UNC Chapel Hill hat....ahem! Stuffed toys are lots of fun and I don't deny Tanner his teddy bears. Yesterday he took one swimming; that was a hoot. But I do watch him closely. Unsupervised, a teddy becomes a mound of stuffing, which if eaten, could block his intestinal tract. We don't want any surgeries, so stuffed animals are definitely a toy to keep an eye out for when your dogs are playing with them. Especially bigger dogs who can destroy them in seconds if they want to. I would be remiss if I didn't point out a couple of additional problems with stuffed toys. Not only is the stuffing fun to eat, but the outside can be too. It is just as hazardous in the digestive tract. Add to that the potential problems of stuffed toys that are made for older human children, and this playtime could turn really dangerous. Bears and other soft toys made for children over the age of 3, often have button eyes or other decorative items sewn on. These items can be a choking hazard, or can cause perforations in the stomach or intestines, if bitten in half and eaten. For this reason, if you have children who collect stuffed animals, it is important to keep them out of reach of your dogs. If you have a dog like Tanner, who can jump straight up about 5 1/2 feet, that means top shelf of the bookcase is about as low as it can go. That may sound like an exaggeration, but I think he has a little of "Air Jordan" in him. Put a 5 foot fence between me and him and he can easily jump high enough to reveal his collar bone above the fence. No kidding! When my dogie was around that age, I already have some stuff for him. I know that playing with toys are part if his growing up. You have a very precise tips. I particularly enjoy toys that make my dogs use their problem-solving skills--interactive toys. They have a few that allow them to figure out how to remove an inside item, or find a hidden treasure. This is great fun and good mental stimulation for your dog. Thanks for reading; it's always good to see you, Dog Signs. 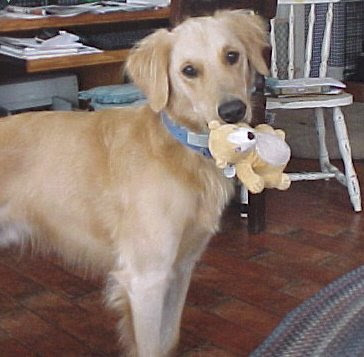 YES stuffed toys can cause damage to dogs, so keep them out of their reach.. Most companies use some kind of toxic gel in making stuffed toys, so I even recommend to minimize use of stuffed toys for very small children. take them out and get some outdoor toys.. They are fun!! !